Started in: 1999 as a school project, research into a woman named Irene Sendler led to the discovery of her heroic role in rescuing children from the Ghetto in Warsaw, Poland during WWII. The founders wanted to bring this story to the world and thus created a play for which they have traveled extensively to present, foster dialogue and increased awareness surrounding multiculturalism. In addition, the project uses project based learning, and seeks continued technological innovation to spread the story and promote conversation. Primary product or service: non-profit foundation that offers a Play, Website used house info and resources for the public re: Diversity and the Life in a Jar Project, Avenue to donate funds to Holocaust Education curriculum in the U.S.A and the Children of the Holocaust Association, there is also info about the Book and Movie about Irene Sendler. What is really interesting about the founders is that they stumbled upon this venture very unexpectedly and at a very young age (began in 1999), they were able to see the opportunity that Irene Sendler’s story had to influence change amongst young people. So now the founders as adults, have evolved in the organization, providing a more comprehensive number of resources and objectives. 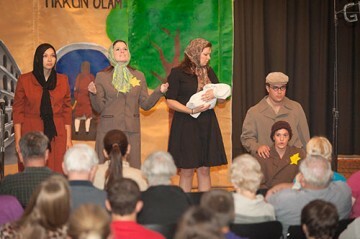 The Irene Sendler Play is one of many plays now available. The project is made available in and amongst other diversity projects and plays. The team has evolved over time to include area experts, board members who are well connected and provided initial funding sources, members of the Jewish community etc. These entrepreneurs have put their idea and experience into an organization that has a not-for-profit mandate, thus solely seeking to benefit society. My own reflections are that the project itself is very interesting, and the founders having gone through the experience of meeting Irene herself, as well as making valuable connections with her family and friends and gaining that support really provides a level of credibility and personalization that I am sure the audience can relate to. In addition, this kind of play and diversity project fits really well into the values that education (primary/elementary/high school) is fostering today and I can see how this group would be readily welcomed. Where I can see room for growth is having more technology integration into the project for those where the play may be out of reach of unable to fit into their schedule. For example, viewing the play live via the web with a group of schools who can then converse and debrief afterwards as an activity. As well, it will be interesting how integrating learning technology could expand diversity projects such as communication between various students across the United States and their experience with the Life in a Jar project.